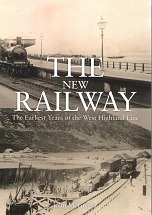 Renowned West Highland Line historian John McGregor this time dedicates a book to the very early years of the West Highland Railway company, who opened the main line from Glasgow to Fort William in 1894. It looks at the politics involved behind the line’s development, as the fish trade started to expand and various extensions were planned to the line, albeit never seeing the light of day in the end. Maps and rare photographs of the line (going back to pre-North British Rly days) are in abundance in this fascinating book. Glenfinnan Online shop is going live! Welcome to Glenfinnan Station Museum.